I often forget how old I am in dog years. I think I am a spring chicken. I may feel aches and pains, but I brush them off and do some crazy things. Take my last (and I do hope it is my last) road trip. My sister decided to move from Michigan to Washington State to live near me. I was thrilled. She put her house on the market last March. It sold in late November. That is not a problem on the west coast of America, but Michigan gets snow in October. She, like many seniors, wanted to move on the cheap. So they rented a 26’ truck and a trailer for one car while following with the second car. Because I had talked her into this lame-brain plan I felt obligated to help. Ergo, I felt compelled to talk my husband into joining me. After all, he had not traversed our great country and he wasn’t getting any younger. I had once taken an Amtrak from San Diego to Chicago and on to New York City. I did not bother renting a berth, because I was 40 and thought I was 16. That was good for four months with a masseuse. This time around I was 68 thinking I was 40. What could possibly go wrong? At least this time we would be staying in a motel room. You know, family style. Two queen beds, two couples and a dog…in one room. It reminded me of childhood ski trips or sightseeing along the Blue Ridge Parkway with my great aunts when I was seven. Only this time I was the great aunt. Did I mention we were starting in northern Michigan just south of the Mackinac Island Bridge? We had flown in Thanksgiving Day (great way to start off any adventure: getting up at dawn, eating twenty dollar snack trays and running to make connections). That Friday we helped them pack the van and took off westward ho. We headed to Duluth because my brother-in-law has family there. I did not meet his family as I was already completely fried and asleep by 6 p.m. Then in eight and 10 hour spurts with pizza and motels in between, our wagon train passed through Bismarck, Bozeman, and Boise. The good news is they had hot tubs in the motels. The bad news is I forgot a bathing suit. The hotel had one size left from the tourist season…medium boys. I was rolling into the trunks like putting on pantyhose. And with a cotton top and a large bath towel to hide my wet T-shirt look I marinated for 30 minutes. Slowly my joints unhinged back to normal and I headed for bed. 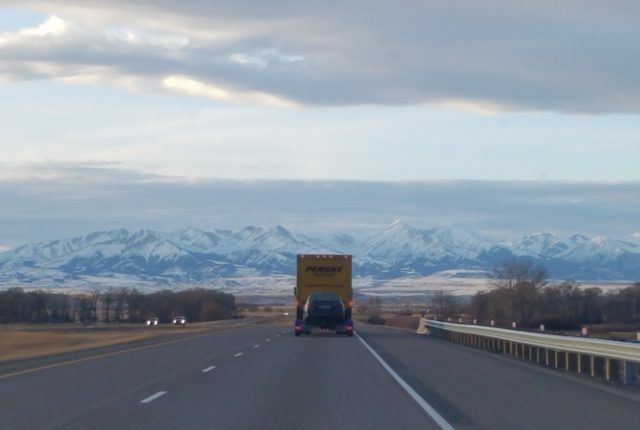 We skirted south of the snow draped mountains of the Great Divide because the truck in its lowest gear on a slight incline was barely pushing 40 MPH. The mountain passes were impassable. One just rolled a bus with a high school band (they all survived) and the other was flipping semis like flapjacks. Now for the description of the great plains in winter. Eh. It was miles of golden fields of what was once waves of grain, but now was more like an old man’s whiskers. 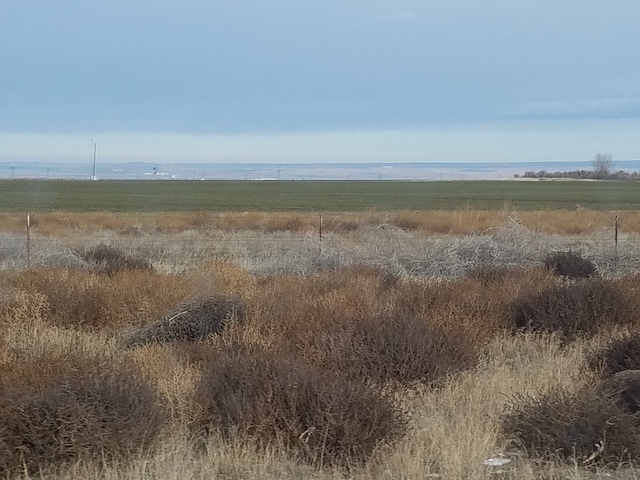 Tumble weed broke loose and rolled past our windshields. Most off ramps went to infinity points in the distance with nary (zip, nada, zilch) signs of life. About every sixth off ramp (every 100 miles) there would be a gas station combo snack bar with bathrooms. We filled up with unleaded gas and highly “leaded” sugary junk food. We emptied our bladders and bought more liquids. We were like settlers at an outpost with Lewis and Clark. Weather was closing in on us with snow flurries and winds worthy of a scene in the Wizard of Oz. We ducked below Idaho and the Rockies and clung to the Columbia River Gorge west coming to our last stop: Portland, Oregon. It was torrential rain threatening sleet. We had been on the road six nights. The only wrong turns the entire trip were due to the guys in the lead truck trusting the siren call of Siri AKA the “Were-witch GPS Demon” who kept trying to take us down “short-cuts” of dirt logger roads and up dead-end scenic inclines with no turn around areas. I simply called them up from the car and told them they were heading toward certain doom and to follow us instead. After all, we had a secret weapon against Siri: maps. And we could read them.